My goal is to educate and guide my patients through both the surgical and nonsurgical care of their spinal condition. Dr. Jackson is fellowship trained and board certified in physical medicine and rehabilitation. He specializes in interventional pain management dealing with the spine. He received his medical degree from Hahnemann University School of Medicine in Pennsylvania. Dr. Jackson completed his residency in physical medicine and rehabilitation and fellowship in Spine Medicine both, at the University of Pennsylvania. 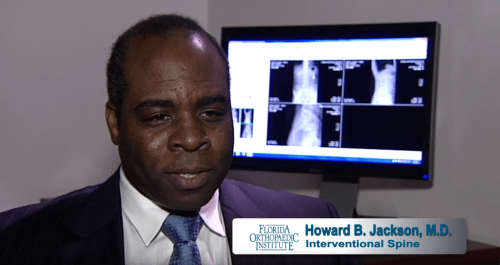 Dr. Jackson focuses on the diagnosis and non-surgical treatment options of neck and back pain. He has given presentations nationally on conservative treatment options for patients with low back pain and co-authored numerous publications on injections, including nerve blocks in the spine. Dr. Jackson currently serves as a member of the American Academy of Physical Medicine and Rehabilitation and the North American Spine Society. We have been seeing Dr. Jackson and his staff for over 13 years. Everything has been excellent. Sarah and Nicole always respond to any questions, RX refills and surgery center appointments in a very timely manner. We would highly recommend Dr. Jackson and his staff to anyone needing his specialty assistance. Thank you. Dr. Jackson is a very thorough & knowledgeable physician. Thank you, Dr. Jackson! I love Dr. Jackson. He is gentle and caring. He takes time to talk with you and makes sure you understand all procedures. I live a four and a half hour drive away, but FOI is so great about scheduling so I can make it a one day trip. I have confidence in Dr. Jackson. I have been under Dr. Jackson’s care for many years and I have to say that Dr. J and all of his staff are amazing and very professional. Dr Howard Jackson is top notch .. the best. He displayed genuine compassion and interest in me as a patient. I did not feel like I was part of a standard mold or that he had a certain course of action and I was plodded on the path. Kudos also to Sara Bowles for her attentiveness and agility to assist in getting all my documents in order for work. She has a stellar can do attitude and then actually does what she says, amazing! The Dr Howard Jackson office is one that I would recommend to anyone who is suffering from back pain. I’ve been treated by Dr. Jackson for quite some time. Sometimes things come up out of our control. Appointments need to be cancelled, and spur-of-the-moment requests need to be made. I would like ito acknowledge Ms. Sara Bowle, Dr. Jackson’s MA, for all she does. Numerous times Sara has shown that she goes “above & beyond” in assisting patients like myself. I had a last minute trip I needed to attend and knew I would not have enough medicine for my trip. I phoned Sara in the morning and asked if I would be able to p/u a perscription in the afternoon. Without hesitation, Sara called me back, confirming my request. Sara handled it seamlessly, no mess- no fuss. Thanks again to F.O.I. and Sara.